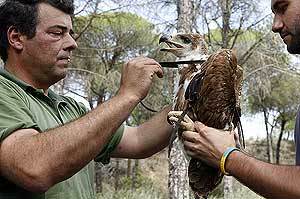 Nine Spanish imperial eagle chicks have hatched this year in Doñana, following the nineÂ of 2006. Only three chicks were born in 2005 due to the severe drought of that year, In the 1990s, an average of just three chicks were born a year. In addition to the 18 born in the last two years, five female chicks have been introduced by hacking. As with the lynx, work is being done on increasing Doñana’s rabbit population, the principal food source for the imperial eagle, with the aim of increasing the number of pairs (8 at present).